Barra lodge is set in one of the most picturesque areas in Mozambique, with spectacular views of pristine beaches and the warm clear waters of the Indian Ocean and is situated just a few kilometers from Inhambane. At the bar and restaurant you can indulge your taste buds while relaxing to the sight and sound of the waves gently breaking on the shore. Fresh seafood dominates the menu, with prawns, calamari and fresh line fish remaining the ever-popular favorites. The tropical beach bar is a very popular meeting place, and creates an atmosphere of relaxation, where the best fisherman's yarns are heard. Here you are invited to gather and watch beautiful sunsets, participate in beach volleyball, pub games or simply sip and enjoy exotic cocktails. The warm Indian Ocean offers safe bathing all year round. The wide open, squeaky-clean beaches offer endless hours of strolling pleasure. Adjacent to the lodge is the salt-water mangrove with crystal clear waters which one can explore by boat or on foot. A huge diversity of game fish abounds in these waters including Sailfish and Marlin. Barra lodge also boasts a fully equipped dive Centre with all the necessary facilities. There are a number of reefs. and pinnacles, some . close and some further away, with dive depths varying from 8 meters to 30 meters offering a variety of diving experiences. Here you can also enjoy a romantic stroll along the beach, or an exhilarating gallop through the coconut plantations on one of the rider-friendly horses. The accommodation at Barra lodge is comfortable I and offers various options to suit everybody's needs. This consists of 19 casitas and 1 family casita as well as 20 self­ catering cottages and 2 bunkhouses. There is also a luxurious live-aboard yacht. Barra lodge's 11 campsites can accommodate 6 people each. 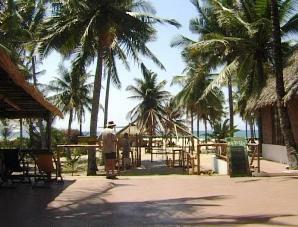 The campsite is situated behind the dive Centre, amongst coconut trees, a short walk from the beach. Electric points and water taps are provided.